I was feeling miserable sitting in a hotel near The Lost Dogs’ Home in North Melbourne. I had just had my beautiful black Labrador ‘Mog’ put down three days before and the emptiness of a house without a dog was intolerable to me. Mog had been my confidante, teacher and companion for ten years. My friend Kate had suggested we have a look at The Lost Dogs’ Home. We did this and retired to the hotel to collect our thoughts. After lunch we went back to the Home where a young Fox Terrier/Jack Russell cross chose me to take him home. I saw him stand on his back legs and look up with eyes that clearly said “it’s me you need”. From that day on I have never looked back. I dubbed the little lad ‘Albert’ then and there, and so our journey began. During the one and a half hour drive home he slept on the passenger seat and did not move an inch. I have always viewed dog ownership as I do marriage. As I walked through the door with Albert in my arms I must confess the concern that ran through my mind was that I had gone in search of a large female dog and arrived home with a small male I could love for the next sixteen years ‘for better or worse’. The answer unfolded within about a week and it was a definite ‘yes’. Each day Albert would greet me with a sort of thankful enthusiasm. He took nothing for granted and thrived on belonging and being loved. Albert, also known to family and friends as Bert, Alby or Mr A. Lert, has become an identity. He is rather theatrical and knows how to work a crowd in order to extract anything from sympathy to food. He is a comedian of the best calibre and accompanied by his companion, Harriet, a large yellow Labrador some two years his junior, can truly give Laurel and Hardy a run for their money. The difference in size, particularly noticeable in their tug of war battles, makes it even funnier. Albert is often seen with teeth clutched tightly to Harriet’s collar, dragging her across the kitchen floor. She remains totally unruffled and compliant. I have seen them in several compromising situations involving moccasins, both pleading innocence. Comedy aside, Albert exhibits great loyalty and, make no mistake, I am his. He is protector to me. He also adopts this role when friends with young children visit, as he takes on a much gentler nature and is well aware that children are not in need of rough play. Albert sits with his head erect and they pat and cuddle him. There is a sort of fatherly glow about him. We have come a long way. At night as I snuggle into bed I reach down and feel reassured when my hand rests on those silky little ears. I know I am safe and loved by this little fellow. 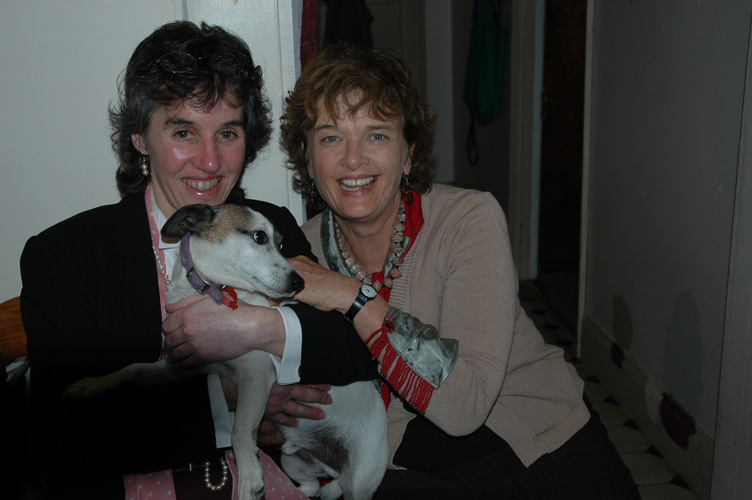 Jeanne’s story appeared in the Castlemaine Mail. Thank you to her and the newspaper in allowing it to be reproduced.